Arrange bacon in a large skillet and cook over medium-high heat, turning occasionally, until evenly browned, about 10 minutes. Drain bacon on paper towels and crumble. 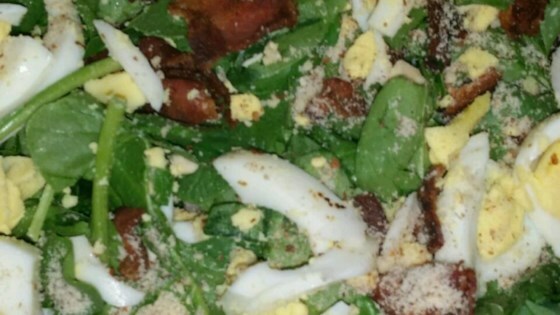 Layer spinach, bacon, eggs, and onion in a large bowl. Sprinkle with almonds and sunflower seeds. Whisk vegetable oil, ketchup, vinegar, brown sugar, Worcestershire sauce, garlic, salt, and black pepper in a bowl; pour over spinach mixture and toss. Serve immediately. That salad itself was good, the dressing was not. I did not care of the taste of ketchup in the dressing. It ruined it for me. Will not make again. Wonderful recipe!!! This will be a staple in our house! Used olive oil instead of vegetable, and red wine vinegar in place of the apple cider vinegar but the rest was the same. Perfect!! I think this is an easy and great recipe. Easy to add your favorite veggies in and also to dressing. I made this to the T. It was just not my flavor in dressing.